I have been meaning to post about this for some time now. Back in Dec, Devon from, OutsidePR emailed me and asked me if I would like to try some of the new Gu called, Roctane and then blog about it. So here is my post about the Roctane she sent me. First off.... Thank you, thank you, thank you to Devon for sending me 12 Roctane to try. I was sent 6 Vanilla Orange, and 6 Blueberry Pomegranate. YUM-O to both flavors. (I think those are the only available flavors) I love this stuff. I really felt a difference from Regular GU to Roctane. I have only been taking it for my long runs, and each run has been awesome and I have felt I could run longer and harder. I give Roctane two thumbs up. Since I am not good at interpreting what exactly the difference is or what it is exactly, I just copied and pasted a description I found when I googled Roctane. The only down side is that it is double the price of Regular GU. But I am willing to pay the difference if it means running longer and harder and feeling great while doing it. If you are already a GU runner, then you will for sure love this stuff. GU Energy Gel is proud to introduce the most advanced energy gel yet, Roctane, designed for the hardest working athletes in sports. Roctane originated as a premium energy gel developed by company founder Dr. William Vaughan to fuel his daughter Laura’s course record at the Hardrock Hundred Mile Endurance Run in the Colorado Rockies. Now, after years of testing with thousands of elite athletes training for and competing in the most physically demanding sports in the world, it’s your turn to fuel up like a pro. 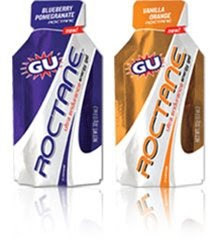 Roctane takes athletes’ top choice for an energy gel, GU, amplifies the original recipe and then adds new ingredients to boost performance in sustained, high-intensity efforts. We start with GU’s superior 80%/20%mix of complex/simple carbohydrates that provide quick and sustained energy. GU’s original recipe also provides an herbal blend of anti-inflammatory chamomile and stomach calming ginger, along with caffeine to metabolize fat. From there we increased the amount of Histidine, an essential amino acid, to act as a buffer and slow the energy-sapping lactic acid build-up in muscles. Thanks for the review. I really want to try Roctane for my marathon training. I'll need something! I'm a fan of Roctane as well..I hope they come out with some new flavours soon..
is there a rule of thumb on the amount of miles you get in before using something like this? Dustie.... I would imagine anything over 10 would be fine. I take it every five miles. But I am sure if you took it for a 5 mile run it would be ok. I think I need to try the whole GU thing again. I saw this recently and wondered about it- so thanks for the review. The flavors sound delish. I like the idea of the chamomile and ginger to calm your stomach. But I wonder about the caffeine. I've used the PowerBar gel twice now, with caffeine, and during my race I felt like I really had to pee (sorry, TMI). I wondered if it was from the gel, or because I drank too much before the race. I don't remember if I had that same effect when I used it the first time for a 12-mile run. Did you notice anything like that when you used it? I definitely liked the energy boost, which I assumed was from the caffeine. Thanks for the review! I keep meaning to try some, but I can only find the Power Gels around here. Great review, I'll have to give these a shot soon! I love these. They really seem to give you an extra kick, and the flavors are great. I wish there were more flavors to try. i love the blueberry one but cant seem to get the orange one down. great review! !